1-4. When therefore the Lord knew how the Pharisees had heard that Jesus was making and baptizing more disciples than John, (though Jesus Himself was not baptizing, but His disciples,) He left Judea, and departed again into Galilee. And it was necessary that He go through Samaria. When God, the Lover of man, became flesh for our sake, the purpose of His every action was to bring benefit to us. So it is here: when He perceived that the Pharisees had heard of His fame and knew that this would incite them to envy, He departed into Galilee, thereby teaching us two things. First, that we should spare our enemies and try every means not to give cause for offense or envy; and second, that we should not throw ourselves into temptation foolishly and needlessly, but instead withdraw for a while until the anger of our enemies has abated. Although He had the power to withstand those who hated Him, even if they had rushed to attack, yet He withdrew from them so that His human nature and flesh would not seem to be an illusion. If He had continuously escaped from their midst, how much scope would this have given to the Docetists, the Manichees, Valentine, and the accursed Eutyches [heretics who denied the fullness of Christ's human nature]? The Evangelist alludes to the slander induced by envy when he says, "Though Jesus Himself was not baptizing," He was falsely accused of baptizing by envious men who wished to stir up the Pharisees against Him. It was necessary that He go through Samaria. The Evangelist describes Samaria as place to pass through, not a destination. Note that he did not say, "It was necessary that He go to Samaria." He wished to forestall any accusation by the Jews that Christ left them in order to go to the Gentiles, whom the Jews abhorred. It was only when the Jews drove Him away that the Lord approached the Gentiles; and even then, He did not go to them on purpose, but only in passing. 5-6. Then cometh He to a city of Samaria, which is called Sychar, near to the parcel of ground that Jacob gave to his son Joseph. Now Jacob's well was there. It would be worthwhile to explain the origins of the Samaritans and how they got their name. There was a mountain, Somor, named after the man who owned it, as Isaiah also says, "And the head of Ephraim is Somoron"[Is. 7:9]. Those who lived by this mountain were not at first called Samaritans, but Israelites. When they sinned against God, they were given into the hands of the Assyrians on various occasions. [See IV King 17:6-7} At last the Assyrian king [Tiglath-pileser III] set upon them as they were plotting a rebellion, took them captive, and fearing continuous revolt, no longer permitted them to remain there. He exiled them among the Babylonians and Medes, and from there brought back Gentiles from various places and settled them in Samaria. After this was done, God demonstrated to the barbarians that He had given the Jews into their hands because the Jews had sinned, and not because He was weak. Therefore He caused lions to set upon the barbarians in Samaria and devour them. When this was reported to the king, he sent for certain elders of the Jews in captivity, and asked them what could be done to prevent the lions from again assailing the occupants of Samaria. The elders explained that the God of Israel watched over that place and would not allow any one ignorant of His laws to dwell there. Therefore, if he felt sorrow for those barbarians, he should send Jewish priests to teach them the laws of God, and in this manner God would be appeased. The king did as they had said, and sent a certain priest to teach the law of God to the barbarians in Samaria. However, they did not accept all the divine books, but only the five books of Moses: Genesis, Exodus, Leviticus, Numbers, and Deuteronomy. Neither did they completely abandon their impiety; but in later years they gave up their idols and worshiped God. When the Jews finally returned from captivity, they always were suspicious of the Samaritans, considering them to be Assyrian by race, and calling them "Samaritans" after the name of the mountain. But the Samaritans called themselves the descendants of Abraham and Jacob. For Abraham was a Chaldean like themselves, and Jacob they considered to be their own because of his well which they possessed. To the Jews, then, the Samaritans were an abomination, together with all Gentiles. This is why they reviled the Lord by saying, "Thou art a Samaritan," [Jn. 8:48] and even the Lord Himself said to His disciples, "and into any city of the Samaritans enter ye not" [Mt. 10:5]. Why does the Evangelist give such details about Jacob's ground and well? First of all, so that you would not be surprised to hear the words of the woman, "Our father, Jacob, gave us this well." For that place was Sykima [Shechem], where Simeon and Levi, the sons of Jacob, committed their savage slaughter to avenge the ravishing of their sister, Dinah, by the son of the ruler of the Sykimites. [Gen. 34] We also learn from the Evangelist's mention of the ground and the well that the rejection of the Jews began long ago on account of their sins. Having sinned against God, the Gentiles took possession of their land, and what the patriarchs had acquired through their faith in Christ, their descendants, the Jews, lost through their impiety. So it is nothing new if now the Gentiles have entered into the kingdom of heaven instead of the Jews. The ground which Jacob gave to Joseph was called Sykima. For it was there that the sons of Jacob slew the Sykimites and left desolate their city, which Jacob gave as an inheritance to his son, Joseph. 6-8. Jesus therefore, being wearied with His journey, sat thus on the well: and it was about the sixth hour. There cometh a woman of Samaria to draw water. Jesus saith unto her, "Give Me to drink." For His disciples were gone away unto the city to buy food. By saying that the Lord was weary from the journey, the Evangelist shows us His humility and simplicity, for He rode not even a donkey on His journey, but walked on foot, teaching us also to need less, not more. The Evangelist also demonstrates that the Lord did not journey leisurely, but with intensity, from which we too may learn to do God's work with zeal and attention. The words, "He sat thus," indicate that He sat simply, as He was, not on a chair, and without pretension rested His body on the ground and refreshed it by the well. Then the Evangelist gives another reason why He sat by the well: it was high noon, "about the sixth hour," and the Lord needed rest and refreshment from the oppressive heat. Lest anyone accuse the Lord of a double standard in forbidding His disciples to go near the Gentiles while He Himself went to the Samaritans, the Evangelist says that He sat in that place because He was tired, showing that his thirst justified His conversation with the woman. In accordance with His human nature, He became thirsty and needed to drink. To the One asking for drink, the woman speaks with words which show her eagerness to learn. What should He have done? Shun this woman so eager to learn, who thirsted to learn the answer to her perplexity? Of course not! That is not the way of God, the Lover of man. We also see here the utter simplicity of the Lord. He is left all alone on the road, while His disciples have gone into the city to buy food. They gave so little attention to the demand of the stomach that at the very time when most people are nearly asleep after dinner they were out buying food, that is, loaves of bread only, from which we may also learn to limit the variety of what we eat. Notice the exactitude of the Evangelist. He did not assert, "It was the sixth hour," but instead, "It was about the sixth hour," so careful was he to preserve the truthfulness of every word of his Gospel. 9-11. Then saith the woman of Samaria unto Him, "How is it that Thou, being a Jew, asketh drink of me, who am a woman of Samaria? For the Jews have no dealings with the Samaritans." Jesus answered and said unto her, "If thou knewest the gift of God, and Who it is that saith to thee, Give me to drink, thou wouldest have asked of Him, and He would have given thee living water." The woman saith unto Him, "Sir, Thou hast nothing to draw with, and the well is deep: from whence then hast Thou that living water?" Perhaps by His appearance, dress, manner, and speech, the Samaritan woman judged the Lord to be a Jew, which is why she says to Him, "How is it that Thou, being a Jew, asketh drink of me?" See how circumspect she is. If there were need of caution, the Lord needed it, not her. For it was not that the Samaritans had no dealings with the Jews, but, as she says, that "the Jews have no dealings with the Samaritans." None the less, the woman did not keep silent, but out of her concern that the Lord was doing something unlawful for Him to do, she attempted to correct Him. The Lord does not show Who He is until the woman's virtue, prudence, and conscientiousness have first been revealed. Then He begins to speak to her of more profound things. "If thou knewest," He says, "the gift of God," which means, if you knew what eternal and incorruptible things God gives, and if you also knew that I am God, Who is able to give you these things, you would have asked for and received living water. The Lord calls the gift of the Holy Spirit "water" because it cleanses and refreshes those who receive it. It is not stagnant, fetid water like that in ponds and wells, but "living" water, ceaselessly bubbling and gushing upwards. For the grace of the Holy Spirit makes the soul constantly active in doing good, and always ready for spiritual ascents. Of such living and ever active water did the Apostle Paul drink, causing him to forget "those things which are behind, and reaching forth unto those which are before" [Phil. 3:13]. Then the woman sayeth unto Him, "Sir." Do you see how at once she abandons her perception of Him as a man of low rank, and instead adopts great reverence, calling Him "Sir"? However, she has not yet perceived the depth of Christ's words; while He means one thing by the word water, she understands something quite different. 12-15. "Surely Thou art not greater than our father Jacob, who gave us the well, and drank thereof himself, and his sons, and his cattle?" Jesus answered and said unto her, "Whosoever drinketh of this water shall thirst again: but whosoever drinketh of the water that I shall give him shall never thirst; but the water that I shall give him shall be in him a well of water springing up into everlasting life." The woman saith unto him, "Sir, give me this water, that I thirst not, neither come hither to draw." She claims Jacob as her father, inserting herself into the noble lineage of the Jews. Do you see the intelligence of the woman? From the difference between the two kinds of water, she at once infers the difference between the two who give these waters. "If," she says, "You can give such water of which you speak, certainly You would be greater than Jacob who gave us this water." Her words, "and drank thereof himself," are in praise of the sweetness of the water in Jacob's well. The patriarch was so pleased by the water in this spring that both he and his sons drank of it. Her words, "and his cattle," indicate the abundance of the water. Not only was the water so sweet that Jacob himself drank of it, the supply was so plentiful that it watered his multitude of cattle. When the woman said, "Surely Thou art not greater than our father Jacob," the Lord does not reply openly, "Yes, I am greater!" lest He appear to boast, not yet haven given any sign of His own power. But by His answer this is exactly what He implies. "He who drinks of this water will thirst again, but he who drinks of My water will never thirst. If you marvel at Jacob who gave you this water, much more should you be amazed at Me. For I give you a far superior water, which becomes a spring of water continuously multiplied." The saints do not receive a portion from God and preserve that same quantity until the end, but instead accept their portion as the seeds and the beginnings of good, which they themselves use up entirely, making it multiply. The Lord teaches this very thing in His parables of the talents and of the innkeeper. The man who had been given two talents earned another two by laboring and putting them to work; and to the innkeeper who received the man wounded by thieves the Lord promised, "Whatever more you have spent of your own, I will give back to you." [See Mt. 25:20-30 and Lk. 10:35] Therefore, this is what the Lord implies here: "I too give water to the thirsty, but what I give does not remain the same quantity that was given, but overflows and becomes a spring." The Lord gave Paul a small amount of water, that is, the catechesis imparted to him by Ananias, but Paul showed this small gift of instruction to be a fountain pouring out torrents of preaching that reached from Jerusalem to Illyria. How then did the woman react to these words? Still in a lowly manner, for she thought that His words were about actual water, yet she also shows signs of spiritual advance. Before, when she could not understand, she had asked dubiously, "Whence then hast Thou that living water?" Now she accepts His words without doubt and says, Give me this water. She appears wiser than Nicodemus, who received a much lengthier explanation from the Lord and still responded, "How can these things be?" [Jn. 3:9] But she already begins to look down on Jacob's well. For she says, "If You have such water, give it to me, and I will no longer come here to draw." Do you see that she now holds the Lord in higher esteem than she does Jacob? 16-22. Jesus saith unto her, "Go, call thy husband, and come hither." The woman answered and said, "I have no husband." Jesus said unto her, "Thou hast well said, I have no husband: for thou hast had five husbands; and he whom thou now hast is not thy husband; in that saidst thou truly." The woman saith unto Him, "Sir, I perceive that Thou art a prophet. Our fathers worshipped in this mountain; and ye say, that in Jerusalem is the place where men ought to worship." Jesus saith unto her, "Woman, believe Me, the hour cometh, when ye shall neither in this mountain, nor yet at Jerusalem, worship the Father. Ye worship ye know not what: we know what we worship; for salvation is of the Jews." "Go, call thy husband." Seeing her eager to receive what He offered and insistent that He give it, He says, "Call thy husband," as if to point out, "You should share My gift with him as well." She answered, "I have no husband," striving at once to hide her sin and receive the gift without delay. The Lord now reveals through prophesy His own power. He enumerates her former husbands and rebukes the man with whom she is now living secretly. Did the woman become vexed at His rebuke? Did she flee from Him in shame? No, she marveled and cleaved to Him all the more, saying "Sir, I perceive that Thou art a prophet," and questioned Him about divine doctrines and not such worldly things as bodily health and money, so inclined was her soul to the love of wisdom and virtue. What does she ask? "Our fathers worshipped in this mountain." Here she refers to Abraham and those with him. For it was on this mountain, they say, that Isaac was led up to be sacrificed. [Gen.22] And how is it, she says, "Ye say that in Jerusalem is the place where men ought to worship?" Do you see how much more lofty her thoughts have become? Only moments earlier her concern was how to avoid the daily labor of satisfying one's thirst; now she asks questions concerning dogmas. Christ sees her capacity to understand spiritual thing, yet does not answer her question (for it was not an important matter), but instead reveals a greater teaching, greater than what He had disclosed to Nicodemus or to Nathaniel. The time is coming, He says, when God will be worshiped neither here nor in Jerusalem. You are striving, He says, to show that the worship of the Samaritans is superior to that of the Jews. But I say to you, that neither here nor there has the first place of honor: there will be another way, superior to both. Yet I also declare to you that the worship of the Jews is more holy than that of the Samaritans. "For ye worship ye know not what: we, the Jews, know what we worship." Christ counts Himself as one of the Jews, speaking in terms of the woman's understanding. She thinks of Him as a Jewish prophet, and so He says, "We worship." In what way did the Samaritans not know what they worshiped? They thought that God was limited to one location [their holy mountain]. This is why, when the lions were devouring them as was related above, they sent word to the king of the Assyrians that the God "of that place" did not accept them. This is also why they continued for a long time to worship idols, and not God Himself. But the Jews were free of this misconception and knew God to be the God of all, although not all the Jews understood this. "For salvation is of the Jews." This has two meanings for us. First, that the good things that are in the world came from the Jews. The knowledge of God and the rejection of idols took its beginning from the Jews; and all other teachings, and even your own Samaritan worship (though it is not correct), began with the Jews. Secondly, the Lord names His own Advent, which was from the Jews, "salvation." For the Lord, Who came from the Jews according to the flesh, is Himself Salvation. 23-24. "But the hour cometh, and now is, when the true worshippers shall worship the Father in spirit and in truth: for the Father seeketh such to worship Him. God is Spirit: and they that worship Him must worship Him in spirit and in truth." We Jews have more than you Samaritans regarding the manner of worship; nevertheless, the worship of the Jews will also come to an end. It is not only the places of worship that will change, but the manner of worship itself. This change is at the very doors, and now is, and the practices taught by the prophets will not last much longer. By "true worshippers" the Lord means those who live according to His own law, who do not confine God to one place, as do the Samaritans, and who do not serve Him with a material, bodily worship, as do the Jews, but who worship Him in spirit and in truth, that is, with their soul and with purity of mind [nous]. Because "God is spirit," that is, bodiless, He must be worshipped in a bodiless manner which is in accordance with the soul. This is what it means to "worship in spirit," for the soul is both spirit and bodiless. But because there are many who appear to worship Him in accordance with the soul, but do not hold to the Orthodox doctrine concerning Him, such as the heretics, He also added the words, "and in truth." For one must both worship God with the mind [nous], and hold to the true doctrine concerning Him. Perhaps someone will say that by these two things, spirit and truth, are implied the two parts of our Christian philosophy, action [praxis] and contemplation [theoria]. "In spirit" means "by action." For as the divine Apostle says, "As many as are led by the Spirit of God, mortify the deeds [tas praxeis] of the body." [See Ro. 8:13-14] And again, "The desires of the flesh are against the spirit, and the desires of the spirit are against the flesh." [Gal. 5:17] Therefore, to worship the Father in spirit implies the active practice of the virtues [subduing the flesh,] while worshiping Him in truth implies the contemplation of the divine. This is what Paul means when he writes, "Therefore let us keep the feast with the unleavened bread of sincerity and truth." [I Cor. 5:8] Sincerity refers to purity of life, which is active virtue; truth refers to divine contemplation, which concerns itself with the truth of the word of doctrine. "Spirit and truth" may also be understood as follows. It was characteristic of the Samaritans to think of God as enclosed in a certain place, and to say that He must be worshipped "in this place." On the other hand, it was characteristic of the Jews that every aspect of their worship was performed as a type and foreshadowing of things to come. "In spirit" was said in reference to the Samaritans, so that what He means is this: you Samaritans offer to God a kind of local veneration. True worshipers will not be limited by locality; they will worship in spirit, which means, in mind and soul. Neither will they worship as do the Jews with types and foreshadowings, but in truth, because the Jewish customs and observances are about to come to an end. Since the Judaic law, understood according to the letter, was a type and shadow, perhaps the words, "in spirit," are in contrast to the letter of the law. ("For the law of the letter no longer prevails among us, but the law of the spirit, for the letter killeth, but the spirit giveth life." [II Cor. 3:6]) And the words, "in truth," are in contrast to the types and prefigurings. Therefore, He says, "the hour cometh, and indeed now is," meaning, the time of My Advent in the flesh, when true worshipers will not worship in one place only, like the Samaritans, but in every place offering bodiless worship according to the Spirit, as Paul also says, "Whom I worship with my spirit." [Ro. 1:9] Nor will they, like the Jews, offer service to God that is a type, a shadow, and a prefiguring of things to come, but instead a worship that is true, containing nothing obscure. Such are the worshippers whom God seeks: spiritual, because He is Spirit, and true, because He is Truth. 25-27. The woman saith unto him, "I know that the Messiah cometh, Who is called Christ: when He is come, He will tell us all things." Jesus saith unto her, "I that speak unto thee am He." And upon this came His disciples, and marveled that He talked with a woman: yet no man said, "What seekest Thou?" Or, "Why talkest Thou with her?" How did the woman know that the Messiah was coming, Who is called Christ? From the writings of Moses, since, as we have already said, the Samaritans accepted the five books of Moses. From these they knew the prophecies about Christ, and that He is the Son of God. For the words, "Let us make man," [Gen. 1:26] indicate that the Father was speaking to the Son; it was the Son Who spoke with Abraham in his tent; and Jacob spoke these prophetic words concerning the Son, "A ruler shall not fail from Judah until there come the things stored up for Him, and He is the Expectation of the Nations." [Gen. 49:10] Moses himself said, "The Lord thy God shall raise up to thee a prophet of thy brethren, like me; Him shall ye hear." [Dt. 18:15] And many other things were proclaimed concerning the coming of the Christ. This is how the woman can say, "I know that the Messiah cometh." The Lord then reveals Himself to her, as demanded by the sequence of their conversation. If He had said right from the start, "I am the Christ," He would not have persuaded the woman, and would have appeared overbearing and arrogant. But now that He has brought her step by step to remember the expectation of the Messiah, suddenly He reveals Himself. Why did He not reveal Himself to those Jews who continuously asked Him, "Tell us if Thou art the Christ," but did so to this woman? He said nothing to those others because they did not inquire for the purpose of learning, but with the intent to slander Him all the more. Because this woman is honest He openly reveals Himself. She questioned Him with all sincerity of thought and purpose, simply desiring to know the truth. This is made clear by what followed. When she heard His words, not only did she herself believe, but she led others into the net of faith as well, always showing her mind to be both probing and believing. At just the right moment, when the Lord's teaching and conversation with the woman was completed, the disciples returned. They were astounded at His humility when they saw Him, a Man renowned and acclaimed by all, condescending with meekness and compassion to speak with a woman, and moreover, one who was a pauper and a Samaritan. They were astounded, but not so bold as to ask what He had been discussing with her, for they were always respectful to Him, as is proper for disciples towards their teacher. On other occasions they did act more boldly, for instance, when John leaned on His breast, or when they approached Him to ask which of them was the greatest, or when the sons of Zebedee asked Him if one of them could sit at His right hand and the other at His left. They did so because they inquired about seemingly urgent matters that pertained to themselves. But in this case, because there was no need to ask about something that did not concern them, such boldness was out of place. 28-30. The woman left her waterpot, and went her way into the city, and saith to the men, "Come, see a man, who told me all things that I ever did: is not this the Christ?" Then they went out of the city, and came unto Him. The words just spoken to her kindled such zeal in her heart that she left her water pot, in an instant preferring Christ's water over that of Jacob's well. Now she becomes no less than an apostle, ordained to this rank by the faith that has taken hold of her heart, teaching an entire city and drawing it to Christ. "Come," she says, "see a man, who told me all things that I ever did." Once her soul was inflamed with divine fire, she gave no thought to anything earthly, not even shame or dishonor. See how she is not ashamed to parade her sins, when she says, "see a man who told me all things that ever I did." She could have spoken more guardedly, by saying for instance, "Behold a prophet Who knew my thoughts." Instead, she scorns her own reputation and thinks only to proclaim the truth. She does not state categorically, "This is the Christ," but rather, "Is not this [perhaps] the Christ?" encouraging them to reach the same conclusion themselves and making her words easier for them to accept. If she had insisted, "This is the Christ," they may have scoffed at her and rejected out of hand the opinion of this woman of such ill repute. Some have understood the five husbands of the Samaritan woman to represent the five books of Moses, which the Samaritan woman alone accepted. Christ's words, He whom thou now hast, they say means, "My word which you have now received from Me is not thy husband," that is, "You have not yet been yoked to My teaching." One could also say that the Samaritan is a type and symbol of human nature. Our human nature formerly dwelt on a mountain, that is, in a mind full of divine grace. Before he sinned Adam was adorned with every divine gift and was even a prophet. When he was raised from sleep he spoke prophetically of the fashioning of the woman and the relationship of the husband to her. He said, "This now is bone of my bones," and, "Therefore shall a man leave his father and his mother…" [Gen. 2:23 and 3:1] Our nature, then, was in this mountain, that is, the lofty mind; but when it offended [and rebelled against] God, it was led away captive, and the devil, who had taken us prisoner, also took our nature's holy seed, by which I mean all divine thoughts, and led them away to Babylon, that is, into the confusion of this world. In their place the devil planted barbarous thoughts. But these were devoured by lions, namely, the good thoughts which govern us as kings, until they were persuaded to accept the words of God. But they did not accept them entirely, for the evil which had once settled in our mountain, that is, in our mind, while accepting the law of Moses, did not become altogether good and remained under the curse. Therefore Jesus journeyed to us, that is, He undertook many paths and stratagems to bring us salvation, sometimes using threats and warnings, sometimes the blows of calamities, sometimes benefactions, and at other times promises of good things. When He had grown weary from His journey and all the methods undertaken for our correction, He found at last another means for our salvation, at which He sat down and rested, and was pleased with it. What was it? 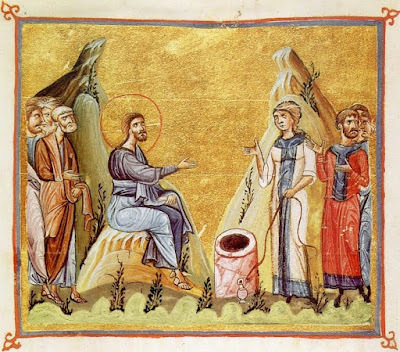 The font of baptism, by which He brought benefit to our nature, as to the Samaritan woman. This spring may rightly be called the well of Jacob, that is, the well of him who tripped by the heel and supplanted his brother Esau. [See endnote (1).] For in the font of baptism a man can trip up and vanquish the devil, because there the Lord has crushed the head of the dragon and given him as food to the Ethiopian people. [See Ps. 73:15] For no others have been nourished and gladdened by this dragon except those who are darkened and black in soul and have no share in the divine light. Five husbands have been yoked to our nature, namely, the various laws which God has given to her: first in Paradise, then to Noah, then to Abraham, then to Moses, and lastly, through the prophets. For Noah received a commandment after the Flood, and Abraham received the law of circumcision. [See Gen. 9:1-17 and 17:1-14] After our nature had been wedded to these five laws, she took to herself a sixth, who was not her husband and whom she had not yet wedded, the law of the New Testament. One might also understand this sixth, which was not our nature's husband, to be the law of idolatry. For indeed God had not given her this law for a husband; instead, she had joined herself to it as an adulteress. Therefore the prophet says, "She [Judah] hath committed adultery with wood," and, "They [Israel] have fornicated under every tree," [Jer. 3:9,6] referring to the pagan carvings and trees which they worshipped. Our nature has fallen headlong to such depths of senselessness as to worship, simply because they are lovely, such beautiful trees as the cypress, the plane tree, and the like. Therefore, when man had loved this sixth, an adulterer, and had fallen into idolatry, then the Lord came and delivered us. This is why He says, "he whom thou now hast," for at the time of Christ's appearing even the wisest of the Jews had fallen into Hellenism, of whom the clearest example is the sect of the Pharisees, who believed in fate and practiced astrology. The Samaritan woman also represents every soul which is yoked irrationally to the five senses and then errs grievously in doctrine, like one who takes a sixth man in adultery. To such a soul Jesus gives good things, either through baptism or through the font of tears. Tears may indeed be called "Jacob's well," springing from a repentant mind which has supplanted wickedness. From this water the mind drinks, "and his children," namely, his thoughts, "and his cattle," those parts of the soul not endowed with reason, such as anger and desire. For tears bring refreshment to the soul, its thoughts, and its faculties. 31-34. In the mean while, His disciples asked Him, saying, "Master, eat." But He said unto them, "I have food to eat that ye know not of." Therefore said the disciples one to another, "Hath any man brought Him aught to eat?" Jesus saith unto them, "My food is to do the will of Him that sent Me, and to finish His work." 35-37. "Say not ye, There are yet four months, and then cometh harvest? Behold, I say unto you, Lift up your eyes, and look on the fields; for they are white already to harvest. And he that reapeth receiveth wages, and gathereth fruit unto life eternal: that both he that soweth and he that reapeth may rejoice together. And herein is that saying true, One soweth, and another reapeth. I sent you to reap that whereon ye bestowed no labour: other men laboured, and ye are entered into their labours." Now he begins to reveal clearly to His disciples the meaning of what He had said before in riddles. "You say," meaning, you think, "that the harvest," namely, the material harvest, "is coming in four months. But I say to you, the noetic harvest is here already." He said this in reference to the Samaritans who were just then approaching Him. "Therefore lift up your eyes, both noetic and physical, and behold the multitude of approaching Samaritans and the souls eager and ready to believe, which are like fields white for the harvest." Just as whitened ears of wheat are ready for harvest, so have these men been prepared for harvest. "And he that reapeth receiveth wages, and gathereth fruit unto life eternal: that both he that soweth and he that reapeth may rejoice together." What He means is this: the prophets sowed but did not reap. Yet they have by no means been deprived of the pleasure of the reward, but rejoice with you who do the reaping. It is not so with [farmers'] harvests, where, if it should happen that one man sows and another reaps, there is only sorrow for the man who does not reap. But in the spiritual harvest, the prophets who preached long ago, cultivating and preparing the minds of men, rejoice together with you who now draw men to salvation. The Lord says, "I sent you to reap that whereon ye bestowed no labour," so that when He should send the disciples out to preach, they would not be overwhelmed by the difficulty of the task. The prophets undertook the harder work, He says, while you are sent out merely to complete what has already been prepared. He speaks truly, mentioning that well-known proverb, "One soweth, and another reapeth." See how He speaks always with authority as Master, "It is I Who sent you to reap" [Ego ymas apesteila therizein]. Let the followers of the accursed Marcion, Manes, and the like, who would sever the Old Testament from the New, take note, for here they are rebuked. If the Old had indeed been separated from the New, how could the Apostles have reaped what the prophets had sown? But the Apostles have reaped the harvest of the Old Testament, which therefore is not estranged from the New—they are one and the same. And let the followers of Arius hear that it is as Lord and Master that He sends out His disciples. He sends them out to cut down and reap Jews and Greeks alike, who had stood planted in the earth and in corruptible things, and to carry them into the threshing floor, that is, into the Church, where they are threshed by the oxen, who signify the teachers, and made subject to them. There they are crushed and broken [signifying repentance and contrition], and when they have discarded all that is chaff, fleshly, and fuel for the fire, they are stored up as pure ears of wheat in heavenly granaries, becoming food for God Who takes delight in their salvation. In this same manner Paul reaped souls and cut them away from the earth, teaching us that "our citizenship is in heaven" [Philip. 3:20]. The words, "look on the fields; for they are white already to harvest," some have elegantly applied to old men, referring to their white beards and the harvest of death. 39-42. And many of the Samaritans of that city believed on Him for the saying of the woman, who testified, "He told me all that ever I did." So when the Samaritans were come unto Him, they besought Him that He would tarry with them: and He abode there two days. And many more believed because of His own word, and said unto the woman, "Now we believe, not because of thy saying: for we have heard Him ourselves, and know that this is indeed the Christ, the Saviour of the world." The Samaritans believed because of the woman's own words, wisely determining among themselves that she would not have exposed the secrets of her life in order to please another, unless the Man Whom she proclaimed were truly great and extraordinary. Therefore, showing their faith by their works, they asked Him to live with them always. For the word "tarry" [meinai] means "to make one's home" among them. But they did not persuade Him, and He stayed there only two days, during which time "many more" believed because of His teaching. The Evangelist does not need to tell us the particular words of His marvelous teaching: merely stating the end result allows us to sense their divine power. Often the Evangelists omit many of His great deeds and words, because they do not write in order to make a grandiose display of His life, but simply to declare the truth. By His mere presence among the Samaritans, the Lord is also teaching something more profound: without any sign or miracle, they believed and begged Him to live with them. But the Jews, when given ten thousand signs and miracles, drove Him away, for "those in his house shall be all a man's enemies" [Micah 7:6]. See how quickly the multitude outdid the woman who taught them. They do not call Him "prophet," or "Saviour of Israel," but, "the Saviour of the world," using the definite article which indicates, "This is the Saviour," Who essentially and in actuality saves all mankind. There have been many who came to save—lawgivers, prophets, angels — but this One is the true Saviour. 1. See Gen. 25:26, 25:34, and 27:36. When the Rachel, the wife of Isaac, gave birth to twins, the younger twin, Jacob, seized the heel [pterna]of the older, Esau. In adulthood Jacob tricked and supplanted [e-pternike] Esau on two occasions, first cheating him out of his birthright by a mess of pottage, and later cheating him of his last blessing from his father Isaac. On this latter occasion Esau cried out in vexation, "Rightly was his name called Jacob, for lo! this second time has he supplanted [e-pternike] me." In the writings of the holy fathers, Jacob becomes a type and symbol of the Christian who is enlightened by the grace of Baptism to struggle against his sins and passions, and by doing so to trip up and vanquish Satan.